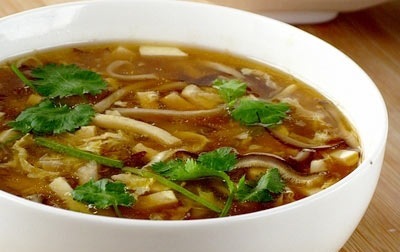 Delicious hot and sour soup does not need to be complicated. This easy chicken version is ready in about half an hour. Boil lemon wedges with rind in 1 cup of water until pulp comes out of the rind. Scrape out additional pulp and juice. Add the diced chicken, spices and chicken broth. Simmer until cooked. Variation: You can add orange juice or substitute shrimp for chicken. Modifications: Add vegetables such as zucchini or small amount of mushrooms.